FITASC is commonly thought of as a style of sporting targets but with a more regimented presentation. It is run by and stands for the Federation Internationale de Tir Aux Sportives de Chasse which is based in Paris, France. Generally a t ougher presentation of the target than an English Sporting and delivered in a set sequence of singles, followed by an on report paid and finally a simultaneous pair. 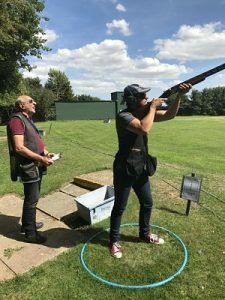 Tony Matthews and Keith Murray put on 2 layouts with 25 birds each for the Southend Gun Club Championship 2017 and they proved to be a challenge for all shooters. By the end of the half way mark the highest score was set Jeff Whistler with a 22 but he was closely followed by Tony Mihill on 21 and Phil Butcher with a 20 but it was all to go for in the 2nd round with a few wheels coming off for a few people. The 2nd layout proved harder than the 1st with a nippy little blaze along the left hand side of the layout and a long in coming looper. 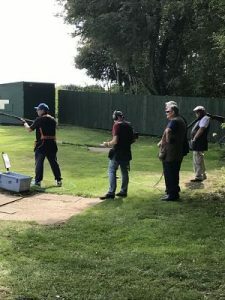 There was some excellent shooting over the course of the day but for most it all went wrong on the simultaneous doubles but it was a glorious day with the sun out and with our usual supply of cups of tea from the canteen the day was a great success. The final scores saw Clive (Olive) Fry romp through to win the Championship with a 41/50 just out pipping Phil Butcher with a 40 and Tony Mihill finishing on 39 having dropped 3 single targets. Finally I must commend the members of the club as about 12 members stayed to clear the traps and generally take down the whole shoot which took about 45 minutes a true members club well done lads, congratulations to Clive Fry for the win and to Tony & Keith for a great shoot.